Size: 24 x 16 x 42 (L XBX H)in inches approx. 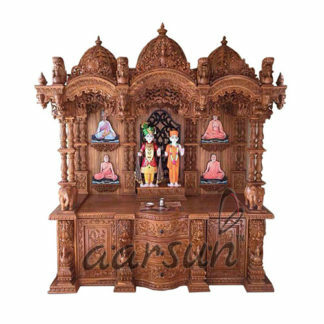 Aarsun presents to you this Handcrafted Wooden Temple in Traditional Design. Made from premium quality Sheesham Wood. The Wooden Mandir consists of Doors in Front with Jaali Design. The Wooden temple consists of a Large Dome at the top with Carving all over with Brass Om. At the bottom of the Temple, slider tray and a Drawer is provided for pooja Essentials. The Base and Ceiling consists of premium quality Teak Plywood. Lighting Provision is also provided inside the Temple. Home Temple and Pooja Units plays a significant role in instilling homes with positive vibes. As we are the manufacturers, the wooden temple can be customized as per your need. Please contact us at +91-8192999135 / 8266888634 for details regarding the design or shade modifications. Sheesham Wood is the most famous wood used by the artisans for making divine furniture or any type of wooden item especially for home or office purpose. It is the best timber wood which is used in India.